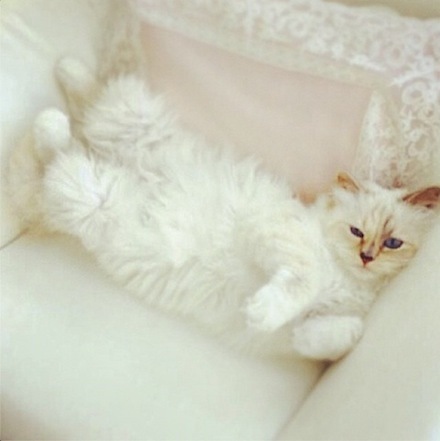 Gotta Love Choupette (Karl Lagerfeld’s Cat)! 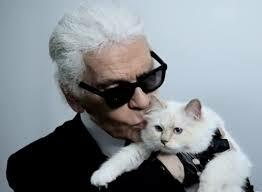 These days, Karl Lagerfeld’s cat Choupette is often in the news. The fashion news, that is. The only kind I like to read when I want to get away from the films that supply me with knowledge and culture, and often heartache. Fashion for me is like the common cat’s (pardon the pun) E! gossip shows or The National Enquirer. Wonderfully mindless, fashion news and interviews transport me to a world where anything is possible. This one with Karl Lagerfeld from Harper’s Bazaar, about his fluffy, outstandingly cute cat Choupette, has got to be one of the most surreal I’ve stumbled across in years. With quotes like “the doctor does her manicure. She hates when we do it ourselves. The only time she makes a scandal is then.” And “she doesn’t like to eat on the floor, so I have to put the food on the table. Her dishes are by Goyard,” all by Karl himself, I giggled myself silly. And longed to be a cat. So, Choupette, and her dishes, her princess style and her two full time maids, is my Style Icon of the week! Read the full interview on Harper’s Bazaar. This entry was posted on Sunday, June 15th, 2014 at 10:14 pm and is filed under Interviews, Modern Fairy tale, Style Icons.